This product contains milk. It's not considered vegan. Which begs the question: why on earth does it even exist? Some might say it's got less calories than regular cheese. Okay. So does the soil in your back yard—and I'm willing to bet the soil is more palatable. I guess this non-cheese is vegetarian. But then, so is regular cow's milk cheese. Know what else cow's milk cheese has going for it? It's edible. Texture-wise, I guess this stuff isn't that far off. 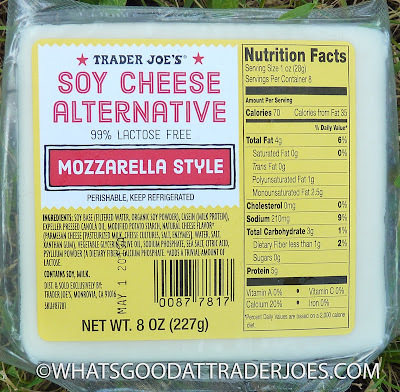 It feels pretty similar to traditional mozzarella, but with a detectable amount of tofu-type texture as well. Buuuut flavor-wise, this is one of the worst things I've tasted in my life. It's difficult for me to describe the flavor. The only other things I've ever had that come close are soft, moist dog food pellets that I tried many years ago. Yes, I sample dog food from time to time...<ahem> but that's neither here nor there. The bottom line is that both Sonia and I found this product entirely uneatable. If you disagree, that's fine. Feel free to share your thoughts below. I'm sure someone will tell us there's a way to cook it or to prepare it that makes it okay, but I, for one, cannot fathom ingesting one more bite of this vile block of bean. This is a big "nope." Going back to Trader Joe's for a no-hassle refund. Half a star a piece on this one. Absolutely revolting. This "cheese" made Sonia very sad. Please watch and like her short video review to make her happy again. Bottom line: 1 out of 10. I'm a vegan, so this substance is of no use to me, and such "cheeses" can be a problem because the less knowledgeable food preparers don't understand the difference. But the answer to your question as to why this product exists is that casein is harmless to the lactose intolerant. Thanks for your comment. I guess that makes sense: 99% lactose free. I should have mentioned in the review that I grew up with many food allergies and sensitivities, including milk. I was treated for them/grew out of them. In my case it wasn't "lactose-intolerance" per se—I probably wouldn't have been able to try this product due to the milk content—but even as a child desperate to enjoy something dairy-esque, I would have avoided this particular product like the plague! Oh no, this is seriously THE WORST faux cheese since those (thank god non existent anymore) rice milk based “cheeses” of the 90s! Totally lame this isn’t vegan, but considering how many much better options there are now it begs the question why does TJs still even sell this?? 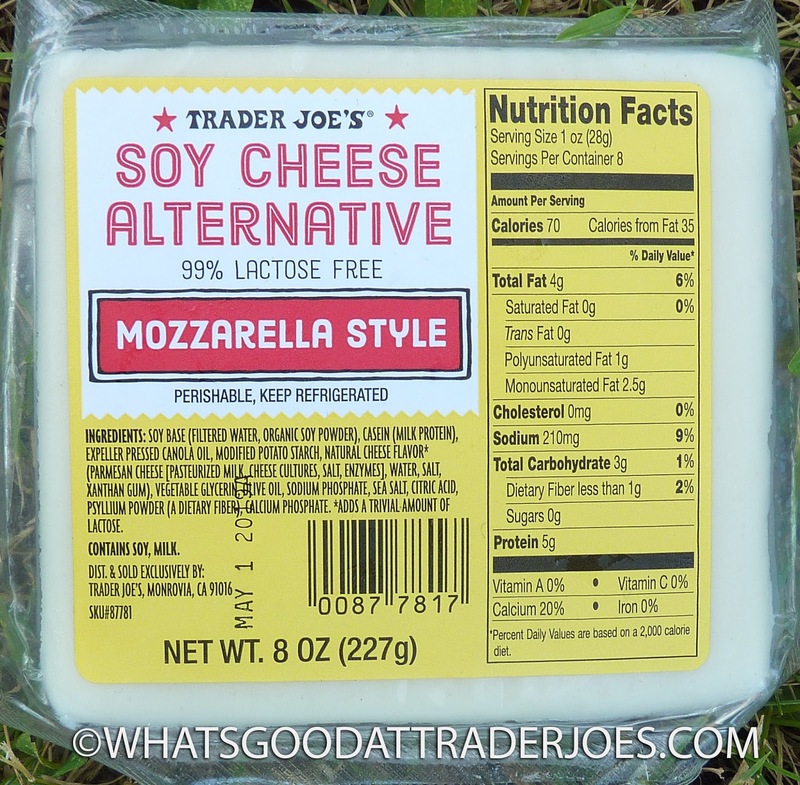 The only passable vegan cheese at TJs is the bag of vegan mozzarella shreds- and only use it melted. 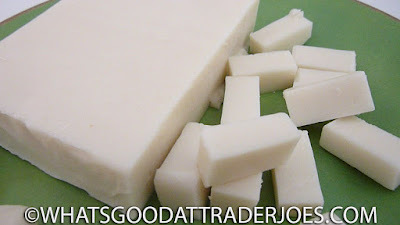 Otherwise nut based cheeses like Treeline, Dr Cow, and Miyokos are the good ones for eating as is. Thanks for taking one for the team here! You got it. Always glad to have your take on things, T! Since I'd used "edible" earlier on, I went with another word. Nice! I didn't know. Thanks for the lesson.